Business owners have one thing in common, they know what they are doing... most of the time. Most successful business owners will all agree upon one thing, they are good at what they do and lets face it, not everyone is in business for bookkeeping and payroll. You probably want to do everything yourself to save as much cash as possible. However, overlooking the importance of an accountant can cause a trickling effect of disturbance in your business system. Finance and accounting processes may be regarded as an integral part of a company but it is also among the most tedious and difficult to stay on top of. Accountants help monitoring expenses, tracking a budget and produce financial statements and tax returns. They can provide assistance in two areas: tax compliance and tax planning. Are you a small business owner up to your eye balls in paper work for employees time charts, sales taxes, and its consuming more time than you thought it would? Accountants have a very specific job to prepare and examine financial records, keep and inspect financial accounts. They eat, sleep and breathe numbers. 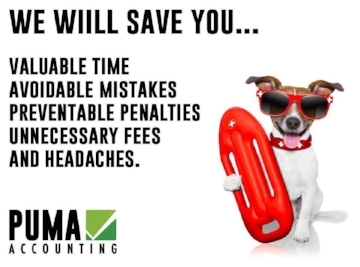 Puma Accounting is built with highly trained IRS certified tax prepares, payroll and bookkeeping specialists available all year round for your business needs. They aren't like the "other guys" who are only opened 4 months out of the year during tax time. Most importantly, they understand business is a day to day, week to week, month to month and year to year kind of relationship. Accountants examine everything to accuracy until the numbers fit perfectly. They also ensure that all statements and records comply with regulations and the laws. Business owners need straightforward, no-nonsense guide on all the payroll and bookkeeping questions, Puma Accounting is an excellent company to work with. We help small business owners face problems with ease. Our payroll solutions allowe companies to enjoy benefits such as saving time and avoiding penalties fined by IRS which may be caused by late and incorrect filings of documents and procrastinating filing quarterly and semi annually. Do you owe the IRS? We specialize in making offers the IRS cannot refuse, saving our clients hundreds to thousands of dollars. We work with you and for you to make your business more efficient system so penalties and surcharges may be avoided. We have had clients owe the IRS $6,000 and the IRS accepted $400. There have been bigger cases where a client owed $90,000 and the IRS accepted $9,000. Our team is trained and ready to attack audits. Shining light on this topic can save you personally or your business from another loan or possible bankruptcy. Maximizing resources under time, budget and employees are important for a business. This is why it is essential for all types of business to make clear cut decisions that would ultimately benefit their business the most. In terms of finance and accounting, while the tasks are essential in a business, working with Puma Accounting could prove to be beneficial and crucial to thriving your business, helping owners to optimize their time and maximize efforts. Taxes start to get complicated when you if you're self-employed, business owner, have multiple income streams or receive investment income. CPA's will help navigate your taxes to ensure you don't pay a penny more than you owe. If you have a payroll or bookkeeping issue you would like to discuss please contact or call us today.